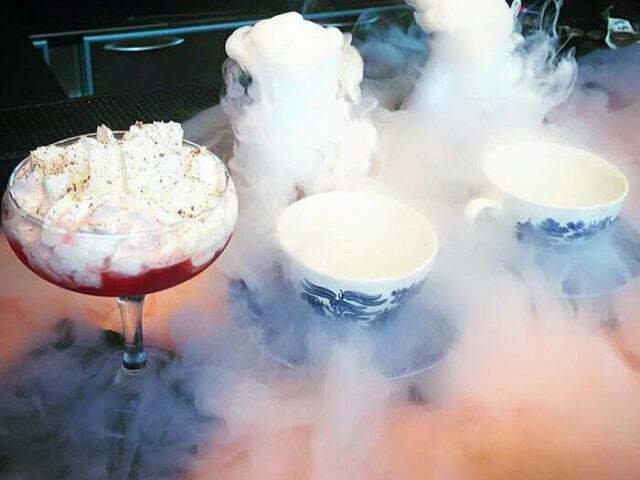 Located in Spinningfields Manchester, The Alchemist specialises in molecular mixology, so you’ll feel as if you are in a science lab as well as a bar. Located in Spinningfields Manchester, The Alchemist is the Hocus Pocus of bars, but the magic doesn’t stop here, they also have six other venues in the UK including Manchester, Leeds, London, Liverpool and Birmingham. The bar specialises in molecular mixology, so you’ll feel as if you are in a science lab as well as a bar. At The Alchemist you will not just have “a drink at the bar”, you will have a drinking experience, so prepare to be amazed as mixologists set drinks a light, create smoke, add bubbles and much more. The space is dimly lit and atmospheric, with chic drop lights throughout the bar creating a warm ambience. With sizeable seating areas, and an all year round outdoor terrace, space isn’t something you will need to worry about here. The stand out piece is definitely their bar name which mounted onto the wall in neon lights. The bar is fully stocked with impressive ceiling to floor shelves of liquor, and the drinks menu is as extensive, so it’s safe to say you will be spoilt for choice. All drinks are of the best quality and wonderfully presented in abstract glasses, chemical flasks and tumblers so be sure to get your smartphone ready as the bartenders perform something magical on your drink. We recommend the “lightbulb moment”, which is a blend of gin, pimms, ginger beer, lemon and mint, it’s dangerously delicious, and of course served with a billowing show of smoke. There is also a great selection of wines and champagnes to choose from if you want to keep it simple. This isn’t just a bar for show stopping drinks, they also serve breakfast, lunch and dinner too, and similar to the drinks menu, you’ll have a lot to choose from. There isn’t a set cuisine here, instead they offer an array of worldly eats, including fish and chips, Japanese ramen, Jamaican jerk chicken, Mexican fajitas and that’s just to name a few. They also do a mean Sunday roast! Lastly, if molecular mixology intrigues you enough be sure to book one of their masterclasses. 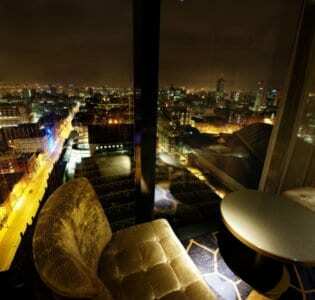 You will be paired with a devoted mixologist and whisked off to a private area of the bar. They will then walk and talk you through the process and science of their wonderful cocktails, and you too will make and drink your very own creation.